[SatNews] The Indian DTH market justifiably captures a hugely disproportionate number of headlines when discussing ‘growth drivers’ for DTH subscribers and revenues. India recently became the largest DTH market in the world by subscribers, and every month it seems some major press release or development comes from the subcontinent. However, often what is lost in all of this excitement is the relatively smaller, but arguably even better positioned, growth market to India’s East – Southeast Asia. According to NSR’s Global Direct-to-Home (DTH) Markets, 7th Edition, Southeast Asia is readied for exceptional DTH growth moving forward for a number of reasons. Firstly, the total addressable market, in terms of TV households, is expected to increase by 36 percent to 2023, with the region adding 50M new TV households. These households will come from fast-developing countries such as Indonesia, Thailand, Philippines, and Vietnam—all of which have higher per-capita GDPs than India. This will lead to higher ARPUs on average than the subcontinent moving forward. According to a recent study by Media Partners Asia, India already has an 80 percent payTV penetration rate, among TV households. By comparison, Indonesia, the Philippines, and Thailand have penetration rates of 9, 11 and 28 percent, respectively. Clearly, there is significant room for growth of payTV among existing TV households in Southeast Asia, which will complement the overall increase in Pay TV households in the region moving forward. 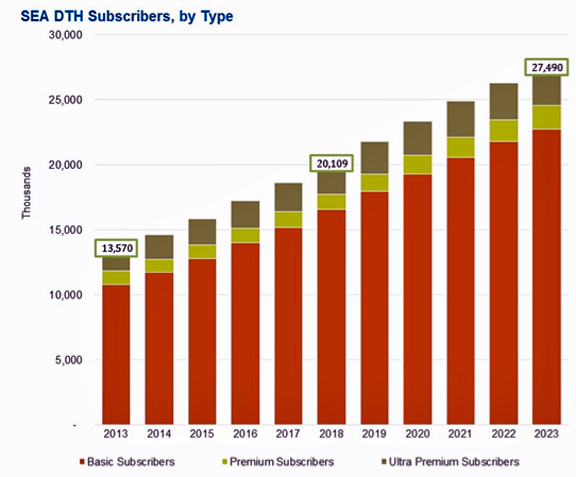 Looking at the largest country by far in the region—Indonesia—DTH platforms have seen explosive subscriber growth. For example, Indovision, the largest DTH platform in Indonesia, has seen subscribers increase from approximately 600,000 in 2009 to nearly 2.5 million in March 2014. In addition, countries like Indonesia, due to geographical limitations, have seen DTH take a huge share of the total payTV market—2013’s breakdown of payTV is estimated to be 84 percent for DTH, 13 percent for cable, and 3 percent for IPTV in Indonesia. Similar geographic tendencies could lead to similar breakdowns in countries like the Philippines in the medium-term as it continues to develop. This is especially the case as fiber will remain prohibitively expensive to lay over a country that contains several thousand islands. It should also be noted that the population of the Philippines is expected to cross 100M sometime during 2014, if this has not occurred already. Therefore, when combining Indonesia, the Philippines, Vietnam, and Thailand (all emerging markets and all with low Pay TV penetration rates) one is looking at a market of over 500 million people. Add in relatively developed and high-ARPU Malaysia, frontier markets Myanmar, Laos, and Cambodia, and cash cow niches like Australia and New Zealand, and clearly there is a real business case to be made in the DTH market of SEA. NSR expects DTH subscribers in Southeast Asia to increase at a rate of over 7 percent to 2023, more than doubling from around 13.5M today to around 27.5M by 2023. Revenues will increase from around $6.5B today to $10.2B by 2023. While its neighbor to the west, South Asia, tends to grab all the headlines, Southeast Asia remains an El Dorado of sorts for the DTH industry. With a perfect storm of geography, a huge population with increasing purchasing power, and an unquenchable thirst for television content powering the region to the forefront of the DTH growth picture to 2023 and beyond, all combined this leads NSR to classify the Southeast Asian DTH market as a region poised for solid growth. There's additional information at this link.